Welcome to Garden Bloggers' Bloom Day for September 2011. Here in my USDA Hardiness Zone 5b garden in central Indiana, I feel as though I am reliving the same September that we had in 2010, yearning for some rain to fall. The primary difference is that this year, I have a garden border that was designed and planted to be in prime bloom late in the season. I spent most of my time there looking at blooms, mostly because I couldn't look at the mess that some of the other areas of the garden are in right now. In my late blooming border, though, I have goldenrod blooming, in particular the world's rarest goldenrod, Solidago shortii. I also have some new asters starting to bloom. One is a dark reddish pink ('Alma Potschke') and the other one is more the traditional violet blue. 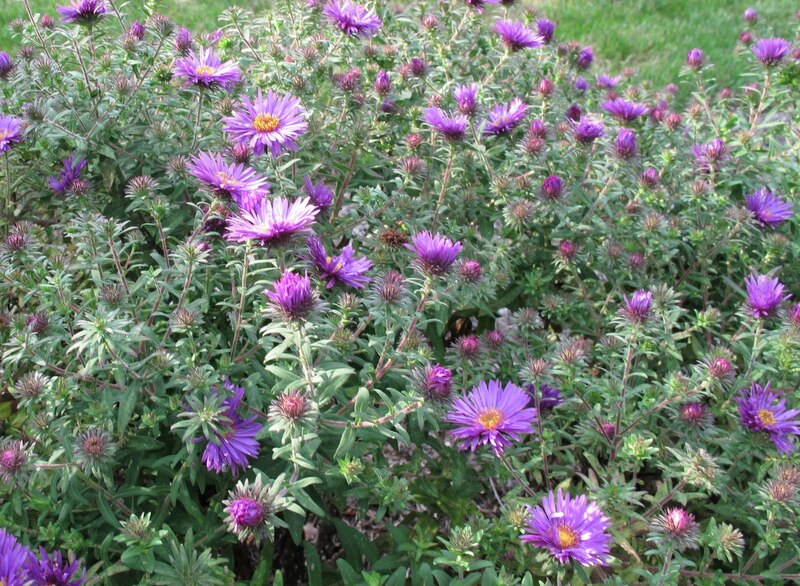 This is Symphyotrichum novae-angliae 'Purple Dome'. 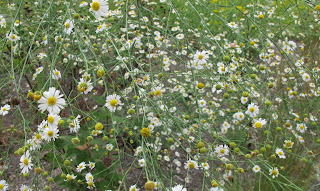 Nearby, Boltonia asteroides 'Snowbank' covers part of the high summer blooming border. When I squint to look through it, it does make it appear like I'm looking through falling snow to see the garden. Falling snow? Perish the thought of it now, though it has turned much cooler as of yesterday and I thought I heard the weatherman say "patchy frost". Elsewhere in the garden, I have some OSO EASY™ Cherry Pie roses, Rosa 'Meiboulka' that have survived in full sun with almost no extra watering. Imagine how they would do if I actually gave them a little care. This one's a keeper for sure, even though it is as red as any flower in my "I don't like red flowers" garden. It's fun to see what we end up with when we forget about what we don't do, and just go ahead and do it anyway. I must credit my garden designer and the hort-enabler for pushing me a bit to allow this "red" rose to be planted in my garden. Out in the front, another keeper rose is Sunny Knock Out® Rose, Rosa x 'Radsunny'. It's got a little bit of everything going on right now. Buds, blooms, faded blooms, and the beginnings of rose hips. I do nothing to it. Nothing. And look at that beautiful foliage. Not a hint of black spot. I'd like to claim it is all my doing, but really, since I do nothing, that would be taking way too much credit. I might as well give credit to the praying mantis that seems to have taken up residence in its branches. I am a traditionalist at heart so I'll wrap up this bloom day post with a traditional September bloom - tall sedum, Hylotelephium sp. These plants are also carefree and seemed to have thrived in the hot, dry summer. All in bloom now in September. They are buzzing with bees and butterflies which flock to them like a gardener flocks to a plant sale. They just can't seem to get enough. I'd show you more blooms, but the rest of the blooms shall be noted to have looked as though they just survived another hot, dry summer, with 42 days of temperatures that were 90F or above and very little rain. The edges of their leaves are crispy, their blooms are all mussed up, and they have seen better seasons. They, and I, are happy to see the beginnings of fall, a time to renew the garden, renew are spirits, and plan for another spring. Just post on your blog about what is blooming in your garden on the 15th of the month and leave a comment to tell us what you have waiting for us to see so we can pay you a virtual visit. Then leave your name and the url to your bloom day post in the Mr. Linky widget below so we'll know where to find you. 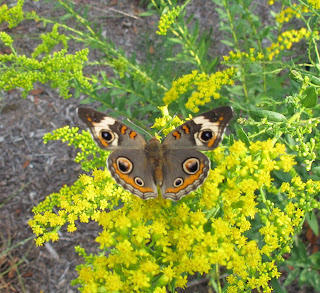 Love the buckeye butterfly photo! The Solidago shortii is fab! Love that butterfly hanging out. Hard to believe your weather forecasters are calling for patchy frost! None of that down here in Texas...looking forward to breaking our streak of 100+ degree days with a "cold" front coming in tomorrow. Temps should be in the high 90's. Your garden is looking beautifully cheery this September. The yellow rose is gorgeous given your hot dry weather; a real winner. I planted Alma Potschke in my previous small sunny garden. She ate half the border and came up to my shoulders; a beautiful monster! Yes, that's the Solidago I had in mind. I'm kind of disappointed with my own Solidago's performance so I'm very happy to see what's possible. Your Buckeye is a pretty shot. They really do love that Golden Rod. happy GBBD! thanks for hosting. boy I wish we could send you some of our rain, our area is just devastated with flooding. Your garden looks like you still have plenty going on for you to enjoy. Please delet entry #3 if you would. I posted from my iphone and I am not sure what happened but it's a bad link. sorry. Thanks and enjoy the rest of your blooms and fall's beginnings. You are ahead of us for fall. If you need another yellow floribunda to join your Sunny KO, I find Julia Child equally delightful and it has fragrance. I love S. 'Purple Dome'. Interesting foliage contrast with the flowers! Thank you Carol. Hope you enjoy all of the blooms this month! 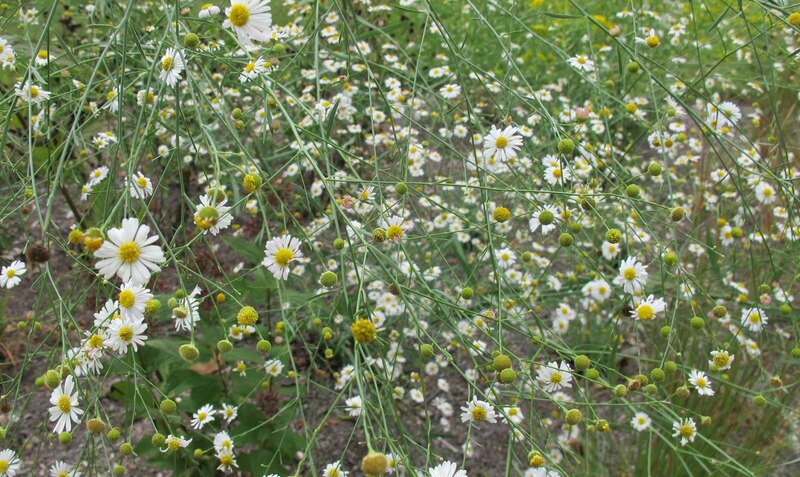 Lovely Boltonia--it is one of those plants that is always photogenic. This is just my 2nd time to join GBBD, at least now i got it ready when you opened. 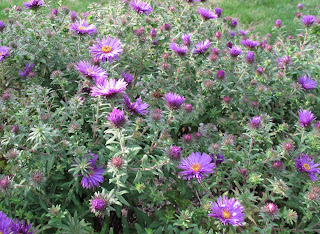 That purple asters look great and i bet it will also do nicely as a strip on a sidewalk. Thanks for hosting. Those sedums are tough. No matter how hot and dry the weather, they always seem to look good, and the bees sure do love them. One of my clients has them in pots all over her yard, and she says she never waters them. That's my kind of container plant! Happy Bloom Day Carol. Thanks for hosting! Happy GBBD! 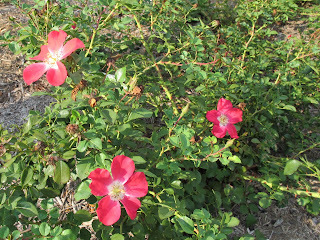 Your sedum and goldenrod are looking well and your roses are still blooming! They are great reliable blooms even when you get that drought. The sedum are doing especially well here too...must have been the pretty dry summer we have had. Enjoy the arrival of Fall and fall blooms! Hi Carol, I love your sedum. They are fantastic plants for an autumn border. Here at Holly Grove I have violas still flowering their little hearts out and lots and lots of apples ripening. The weather has been and continues to be extremely dry; I never thought I'd wish for rain here in the UK! I'm looking forward to my journey around the other gardens featured in this month's garden bloggers bloom day - thank you for hosting. we have the same flowers, the Boltonia and the Sedum for example, but yours are more developed! Happy GBBD! We are having rainy season here. I love summer. You will have drag me kicking and screaming into fall. I love your sedum. we've not had drought here in southern uk this summer (spring was dry, but it's rained since June) so everything is lush. Asters are fab at this time of year aren't they? If I had just been through a garden remodel as you have I would be in a near dead faint what with the horrid weather we have had this summer. It appears that your garden has survived. Here is to a better winter. Happy GBBD. Your photos and blooms going on right now are lovely. Flower Carpet Roses are hard to beat. I'm glad your "September Dream Garden" is doing so well. My boltonia is on its second year in back of the border, should take a look. The goldenrod is radiant, and pretty asters. Have planted our first perennial aster (a. lateriflorus Prince) this year, and it has grown nicely; next year it should be covered in tiny pink-eyed flowers, and I look forward to adding a few more asters to it. My favorite day of the month! So glad we are getting peek into all the pretty gardens before the weather gets colder this weekend. Thanks for hosting! Our aster pictures look almost identical...the weather has been fickle and today on this bloom day we hover between 40 and 50...brrr...but the garden will love that little shock...Happy GBBD!! The sedum is lovely as it reaches up for the sky. And I really like the buckeye butterfly photo...very nice. Thanks for hosting! We came home from the Fling and our holiday to be greeted by the coldest and dullest August since 1993, so Autumn's arriving early on this side of the pond this year. It has been a tough summer this year all around. It is a true test of what plants will thrive in our gardens. You still have many lovely blooms. I love the shot with the buckeye! Hopefully fall will be a little more forgiving. Happy GBBD and thanks for hosting! Great shot of the Buckeye. Looks like your new garden border has the perfect plants to withstand our unpredictable Midwest weather--lovely! Love the Buckeye photo; it's nice to have them back this summer. We got a nice little rainshower yesterday; did it miss Indy? The butterfly picture is spectacular! My zone 6 garden is a little behind your zone 5. We had a very hot and dry July and torrential rains in August. Our mums, asters and anemone flowers have not opened. Hi Carol, I am so glad that you have a border packed full of lovliness to distract you from the damage elsewhere. Such is gardening, particularly with the weird weather this year. Lovely rose, and how great to know it doesn't actually need to be cosseted to look good. I think we had frost last night. I haven't assessed the damage yet, but I usually go with the flow and don't cover anything. Your border plantings are lovely! Asters and roses - who'd have thought it? We've got just the same combination over here in southwest England. it HAS been a rough summer - but can't tell by the looks of your photos! I love that goldenrod. I'm glad it's doing well for you and the butterflies. What a stunning butterfly. I don't think I've seen one like that before. Sunflowers and Zinnias and blooms from the vegetable garden at Lizard's Hollow! Loved seeing your Boltonia, Carol - that's one I just can't get to grow in my garden (too dry, I suppose)! Thanks for being our hostess today, it's always a great party! I had no idea that you had had no rain this summer. It aways seems when I look at the weather forecast that we are the only ones in a drought. I too have places in the garden I don't want to look but some that suggest we are not in a drought. The butterfly on the goldenrod is lovely and so fall-like. I looked at my stand of goldenrod on the septic field. It is completely brown. It may even be dead. I am happy to see yours. Also, I have the same radsunny. It is the greenest thing in the garden. As you say not a spot of black and all phases of flower and fruit. Sending some rainy vibes your way. Thanks for hosting GBBD! Beautiful flowers Carol. Thanks again for hosting again. Okay, I am envious of your abundance of blooms. I am inspired, too, to keep trying on my own. I have killed so many asters, but I must get me some tall sedum. How beautiful! I appreciate your reminder that fall is on the way. Thank you for encouraging me to keep blooming. I'm encouraged that you have so much blooming during this drought. Gardeners, don't give up! What a smart thing to do to add more fall blooming flowers to the garden! Every year I realize my garden is lacking in this area. Loved seeing your roses, and I just love asters! Their little blooms are so sweet and cheerful. Happy GBBD! Thanks for hosting. We're still in the middle (or hopefully near the end) of the worst drought in our history. Still, some plants survive. Oops - sorry for posting twice. A rookie mistake. Very nice pictures. Thanks for hosting GBBD as usual. Another month and another collection of blooms for you. Like yoou my sedum is now in full flower - though I haven't included it in this month's offering. Thanks again for hosting Garden Blogger's Bloom Day. What great creatures and blooms you have in your garden! I don't know the name of everything growing in PA yet... so if anyone can help, I'd really appreciate it! I might have some names wrong. I'm very excited to see everyone's blooms!!! The asters look great! We have golden rod everywhere right now but just the wild kind not the cultivated varieties. Rarest goldenrod in the world? Say no more. I want it. Thanks as always for hosting GBBD! You are yearning for rain to fall and we have had too much (it's pouring again in Western Massachusetts right now). However, it seems both areas still have great blossoms. My favorite is the purple asters. I had thought one of my bloom day photos was an aster, but it doesn't look much like yours, I am starting to think I wrongly identified it. Doh! I accidentally linked to my August post instead of my September post. I have relinked and Sept is under 79. August is 40. I love the goldenrod and sedum. Your flowers are looking so pretty and natural! Can't wait to look at ALL the other gardens' flowers. Thanks for sharing your flowering, too - looks great to these desert eyes! Our Autumn Joy Sedum is starting to flower, just smaller than yours. I love your photo of the Solidago and the butterfly (as others have said). Such a fall color palette! Lovely butterfly. I haven't seen a buckeye in my garden this late summer, but then butterflies of all kinds have been scarce during this terrible drought. But one week until autumn - hope springs eternal! It's my first GBBD! I've posted Hibiscus, Lily, Daylily and Canna. Thanks for hosting! I need to get me some asters, yours are lovely! As always thank you for hosting- I love jumping all over the place checking out what is blooming all over. Great butterfly shot! Such a beautiful butterfly on a beautiful goldenrod! This is my first time at Bloom Day as I am a fairly new garden blogger. Thanks for hosting this fun garden blogging get-together! Agreeing with the butterfly, I've got to admire that goldenrod. It was a long, tiring summer for our gardens, and they seem to be rejoicing in the cooler air of fall. My big excitement is the Sanguisorba is finally blooming. Beautiful fall blooms on your pictures make me want a backyard garden too. For now I am gardening indoors mostly with orchids and wanted to join your Bloom Day with my blooming vanda. Thank you. Thanks for endorsing the goldenrod. I keep telling my companion that it's a flower - not a weed. But all the goldenrod in the surrounding pastures make it hard for me to argue my case. Seeing some horticultural varieties is definitely a help. Happy GBBD! 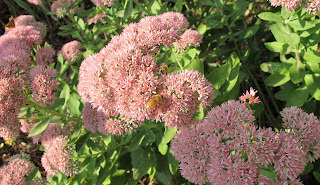 Love your photo of the sedum and the happy bees. Frost? Seems like I can remember what that is. We seem to be stuck in summer, here in Central Texas. Thanks for hosting Bloomday. It made me get out and see that not all is lost. I knew it wasn't. But, this heat and drought have just been depressing. Thank you hosting another GBBD. I am sorry that your summer has been so hot and dry. It seems that there are few places in this country right now that are not either on fire or under water. Maybe things will moderate some. Thanks again! As you can see see I was having troubles. And I am not sure if its the weeds or the flowers that are blooming here in September. Thanks for hosting this links party! For my post, I stayed true to my vegetable gardening roots and posted a picture of my beans. They are absolutely gorgeous right now! And I would go with a wildish rambling rose any day, no matter what color it is! Asters are some of my favorites and are the namesake for my dog. Many thanks for hosting for GBBD! I'm glad you host this every month. It's such fun to see what everyone has in their gardens all across the country, and even a few across the world! love that buckeye butterfly carol! it must appreciate the finer, rare things in life. happy bloom day! Wow, lots of lovely plants! Glad your first shot is that of a butterfly. So is mine. :)That tall sedum has spongy -looking flowers. Have a Happy GBBD. Such a miserable year to be a kitchen gardener at my house. Not much in bloom in the vegetable bed, and too much mud to hazard it. Still: I managed to find something to write about. I hope it isn't too disappointing. Can't wait for rain here, too. Nice to see boltonia, such a good plant. Happy Bloom Day! Hi from your newest follower. This is my first time linking and I hope my post is fine. thank you so much for having me and looking forward to visiting all the gorgeous blogs linked up. Goodness, hard to believe you are hearing talk of "patch frost", although I definitely recall crisp autumn days in Indianapolis and occasional snow by Halloween. We have had one very cool morning in the low 40s, though last week was the hottest of the summer. Here is to summers last fling!! So nice to see our lovely flowers. How delicious - frost!! We are not sure it will ever be cool again down in Texas. Well... I figured out how to mess up a simple Mister Linky post: I accidentally entered August's Bloom Day post link for September. I've since added a link to the actual September post. Carol, if you're willing to take on the hassle, I'd be happy to see the 1st September Cityslipper post go away. Sorry I'm such a ditz. Hi, Carol! Late as usual, but better late than never, as my grandmother used to say (frequently, in my case). Carol, you're opening photograph is a show stopper! Thanks for hosting this monthly trip through everyone's gardens! Pink. Today my blog is about pink. More like PINK than pink. We won't be seeing much PINK or pink in our zone 5 gardens soon. Loving the color in your garden and mine right now. I've been contemplating getting that yellow knockout...now I might just have to! Thanks for hosting, Carol. I'm late, but I finally got my GBBD post up a few minutes ago. All your blooms look luscious. 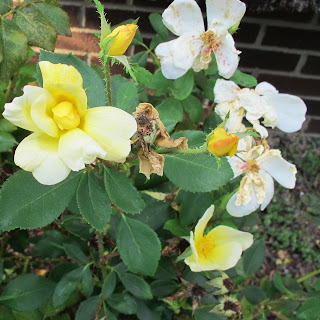 I'm not usually a big rose person, but I really like that pale yellow Knockout! As the saying goes: 'Better late than never'! I am soooo tardy for Bloom Day! Better late than never, though, right? Getting some heat relief here -- wonderful cool 66 here this morning. Love your Knock out rose - it's one of my faves. The new border is just bursting with blooms, too - you must be very pleased with it. It's delightful.